I had forgotten just how much mist is created by The Falls. The mist certainly looks like billowing smoke, from a distance. I had visited The Falls once before, nearly 20 years ago. After receiving my learner's permit to drive, my Mom and I took a girls-only trip out east. My Mom had a rule that we couldn't get our driver's license until we had so many miles of experience under our belt. A road trip would help us achieve those miles. The Falls were just as beautiful as I remember them. 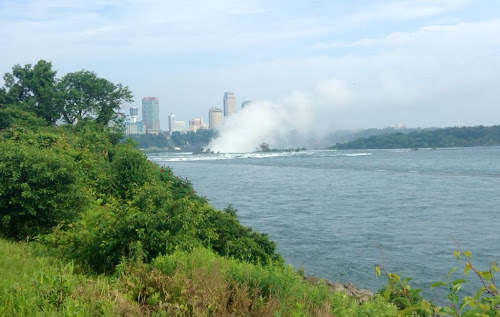 My Mom and I had done The Maiden of the Mist boat ride, which took us beneath The Falls. Although I felt as though I had already "done" The Falls, it was indeed nice to see them again. Especially since I biked to them this time. 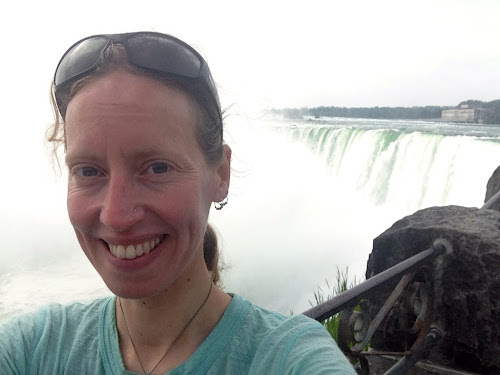 Me, at The Horseshoe Falls. I passed back into the United States at the Queenston-Lewiston Bridge. Holy border crossing chaos! I managed to successfully swim through the confusion of getting a bike across the border at this location, and then I was on my way. The first 20-ish miles of riding in New York were on a road called "Upper Mountain Road." As the name suggests, there were nice, sweeping views of valleys down below. It was such wonderful riding! If this is at all representative of the rest of New York, I'm going to like riding through New York. 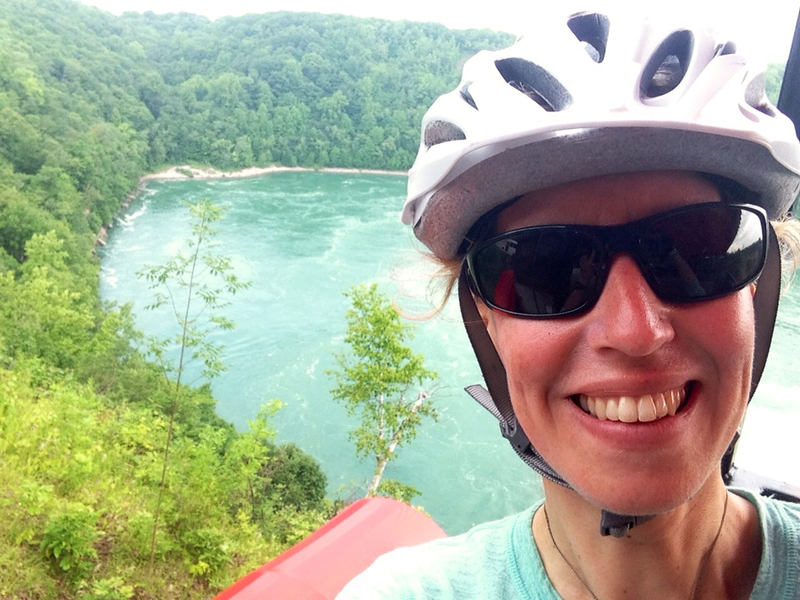 Next, I rode along the Erie Canal. The canal runs for 363 miles from the Hudson River in Albany to Lake Erie in Buffalo. The canal offers a navigable waterway between the Great Lakes and the Atlantic Ocean. 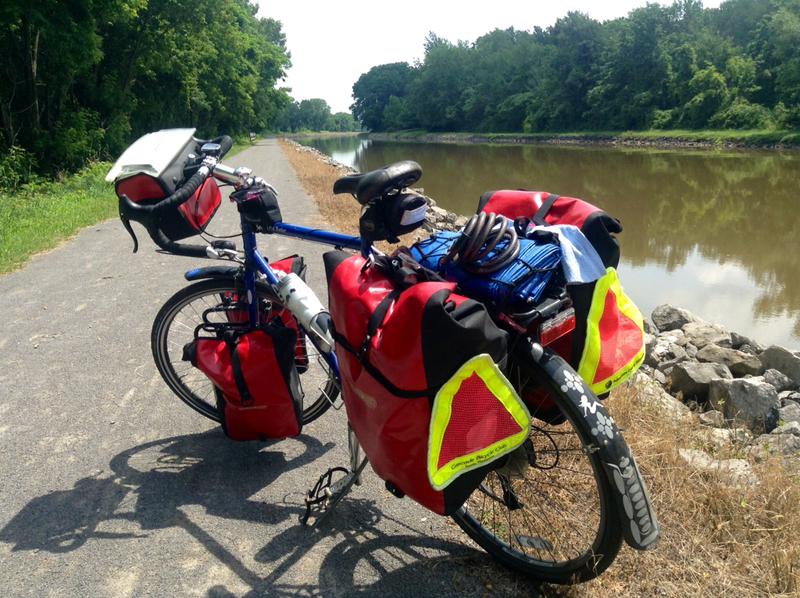 My route follows 90 miles of the Erie Canal. I'll be leaving the canal about 20 miles east of Rochester. I did about half of my route along the canal today, and I'll finish up the remaining portion tomorrow. As I entered the Canal trail, I was warned by a cyclist that "it's a boring ride." Indeed, the trail looks pretty much the same the entire route. And, the route is as flat as a pancake, though it does do quite a bit of winding. So, I whipped out the headphones and listened to music as I rode. Accompanied by a soundtrack, the miles flew by. Oh yeah, and I didn't hold back at all when I wanted to sing loudly along with my music. Hey, nobody knows me! 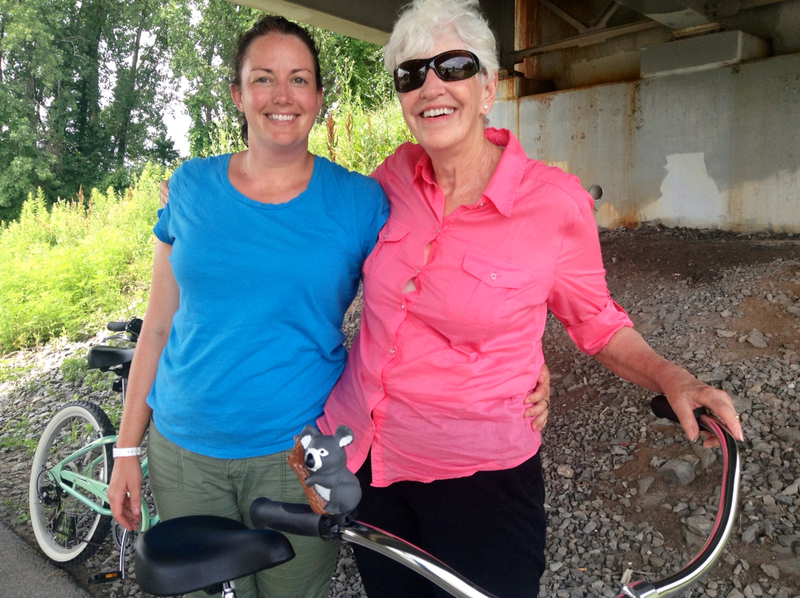 A little while into riding along the Erie Canal, I ran into Emily and her mom, Roxie. What a cute biking duo - they totally reminded me of my mom and me. Emily snapped the below photo of me and emailed it to my mom,along with the brief message: "Your daughter is delightful." Wasn't that sweet? The photo Emily sent to my Mom. Look at that lovely, glowing circle of dampness on my belly! Yuck! I now understand why it feels as though people are treating me more and more like a bum everyday! Speaking of which, I pulled off the Erie Canal to use a restroom in the town of Medina. I stopped at a convenience store and was told there was no bathroom. So, I went out back behind the building and popped-a-squat. Hmmm...maybe in addition to looking like a bum, perhaps I'm also starting to act like one, too. I'm having less-and-less patience for playing the hot-potato bathroom game. Ya know, the "we don't have a bathroom, but the restaurant across the street has one." I received a reply from Evan first, saying he'd be able to host. Awesome! But then shortly thereafter, I also received an email from Chris saying that he was available to host as well. Ah, when it rains it pours! I informed Chris that I'd be staying with Evan. Which was fine. 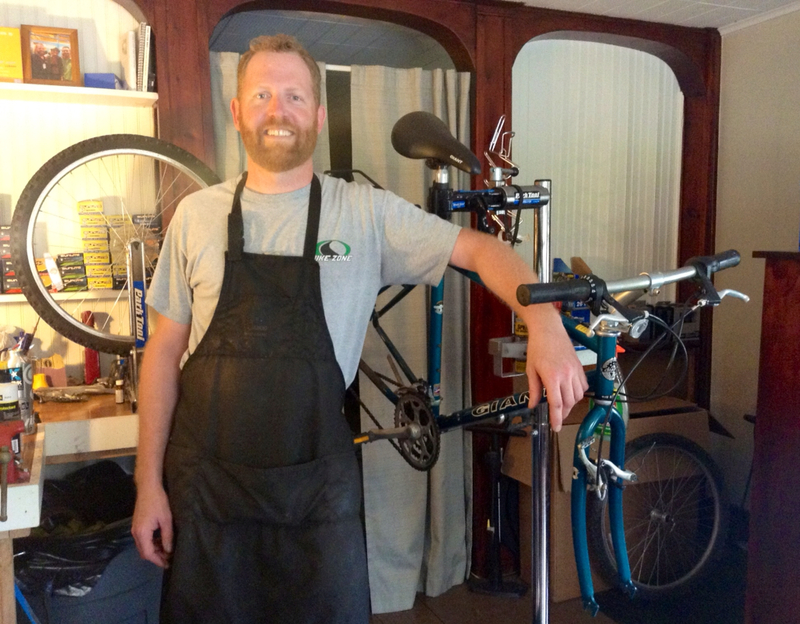 Chris has a bike shop along the Erie Canal, and so he suggested I stop by and say "hi." Which I did! Chris just opened his bike shop about a month ago. He's super passionate about bikes. I think he'll do quite well. After chatting with Chris a bit, I rode over to Evan's house. Evan is in his early 20s. He's a really cool guy. He's leaving at the end of this month for a "walkabout" of sorts. Yes, he is hiking across the country. He hopes to hike for at least one year, if not longer. How fun! He'll be keeping a blog. I can't wait to follow his adventures! When I got to Evan's place, I took a shower (a very cold one), we had dinner, we picked berries, and then we went for a super-duper refreshing swim in the backyard pool. Ah, it was wonderful! I learned from my tour last summer that if you stretch a chain too far, you'll do damage to your chainrings and cassette. After learning the hard (read: expensive) way, I decided to carry a replacement chain with me so that I can swap it out whenever needed. The folks at Ray's Bike Shop in Clare, MI had measured my chain wear at 50%. The drivetrain had felt kind of clunky the last day or two of riding, and so I figured it was probably time to swap out the old chain for the new. Chris was kind enough to measure the wear when I was at his shop today, and he said it was time for replacing. So, I did that tonight. I'm looking forward to a smoother ride tomorrow. There was a fireworks show in Albion tonight. Evan asked if I wanted to go. If I had not biked 90+ miles today, and if I wasn't biking 80+ miles tomorrow, and if it wasn't ~8 miles each way to-and-fro Albion, and if the fireworks started at 6pm instead of 10pm, I would have joined Evan. I'm glad he felt comfortable leaving me at his place and going without me. Evan wants a Long Haul Trucker, so he rode my bike to the fireworks to test out the ride. At least Shirley got to enjoy the show! 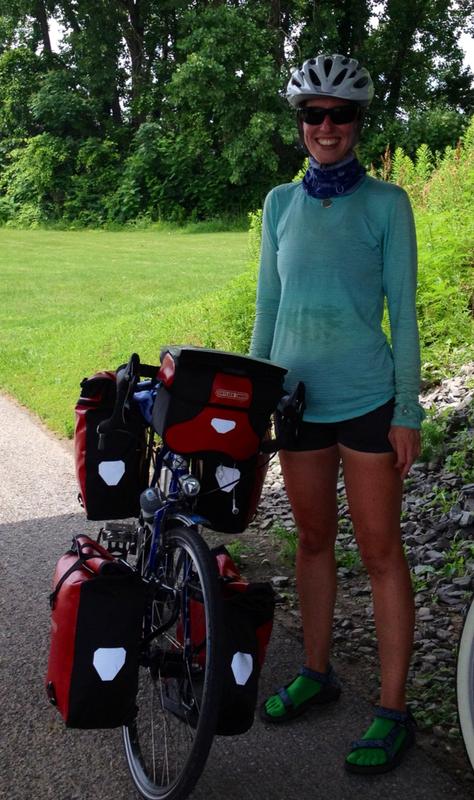 It is perfectly splendid days like this that remind me why I love, love, love bike touring! I'm so excited to ride through the Adirondacks in just a few days! Laura from Benthub here...wow congrats on your 90+ mile day. 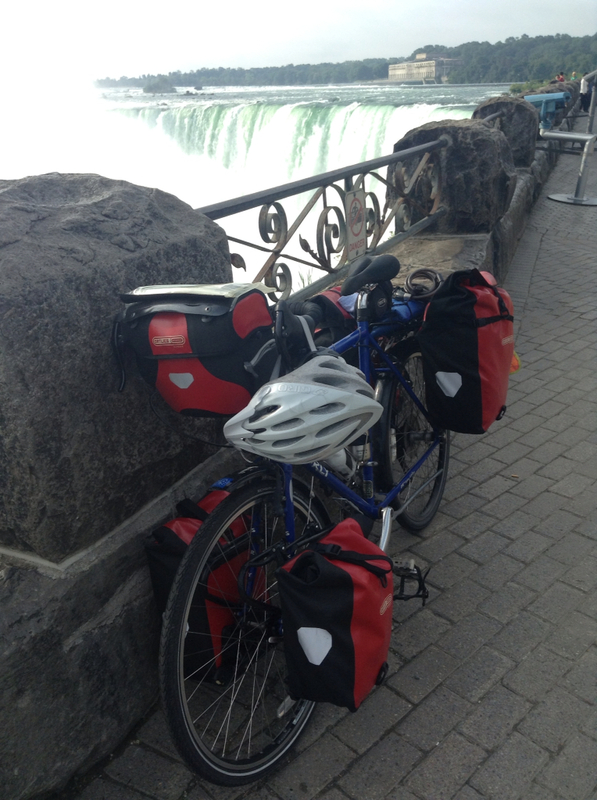 We left from Fort Erie this morning and only made 65 miles to Middleport. That Lewiston bridge was crazy for us too! Glad to hear you're still doing well. Best of luck on the rest of your journey. It was a pleasure to meet another female cyclist my age. I would love to talk more, but I don't think we can catch you! Hey Laura! Great to hear from you! I've been thinking about you guys, wondering how the ride is going for you. Yeah for blogs - it's easy to check up on your journey. It's fun to see that we're riding the same route, taking many of the same photos, and noting many of the same observations. Happy pedaling! I dont know you but Good Job!!! I love seeing people getting out and exploring and having adventures. I also know Evan and would recommend him as a great host.